Essential oils are a concept that I have recently gotten into a little more this year. Not only do I use them on my face for multiple reasons, in my drinking water but I use them to activate different moods or stresses in my home. What is a hydrophobic? It is the physical property of a molecule. What is an aroma compound? It is a fragrance. In a nutshell, this is a pure substance. It’s the essential oils that are being derived from plants for their healing properties. Now that we have that out of the way! I want to share what I’m currently using and why as well as what I plan to be using to combat stress, sickness, sleep loss and more. 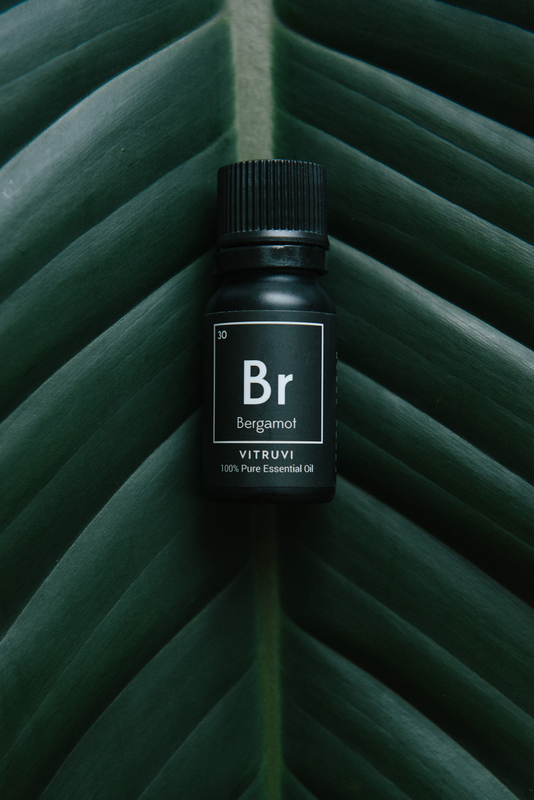 What does Bergamot help with? The oil is effective against depression, stress, fear and anxiety. Why do I use it? This helps relieve some of the stresses from our day to day with work, schedules, etc. We also have cats that aren’t getting along at the moment so when they act up we switch on our diffuser and let the Bergamot aroma spread through the apartment. What is Rosemary? It is a woody, perennial herb with fragrant, evergreen, needle-like leaves and white, pink, purple, or blue flowers. What does Rosemary help with? The oil is effective against hair loss. Why do I use it? This was a little trick from Sara, the owner of Vitruvi. Applying coverage to your brows at night can promote natural hair growth for fuller brows. Even though I have microblading done I still want the hairs on my brows to be a little more full, naturally. What does Eucalyptus help with? The oil is an effective anti-inflammatory. Why do I want to use it? A few hours a day in the diffuser can combat any inflation inside of my body that I may not be aware of. What is Lavendar? Lavandula is a genus of 47 known species of flowering plants in the mint family, Lamiaceae. What does Lavendar help with? Most commonly known for its relaxing effects on the body, therapeutic-grade lavender has been highly regarded for the skin. It may be used to cleanse cuts, bruises and skin irritations. Why do I want to use it? Lavendar has a great calming benefit that can ease you to sleep better and get a full night sleep. What is Peppermint? Peppermint is a hybrid mint, a cross between watermint and spearmint. What does Peppermint help with? Peppermint essential oil gives a cooling sensation and has a calming effect on the body, which can relieve sore muscles when used topically. It also has antimicrobial properties so it can help freshen bad breath and soothe digestive issues. Why do I want to use it? Peppermint is a great alternative to combat headaches and sore muscles. This would be the ideal oil to use in the diffuser after a workout or during a headache. 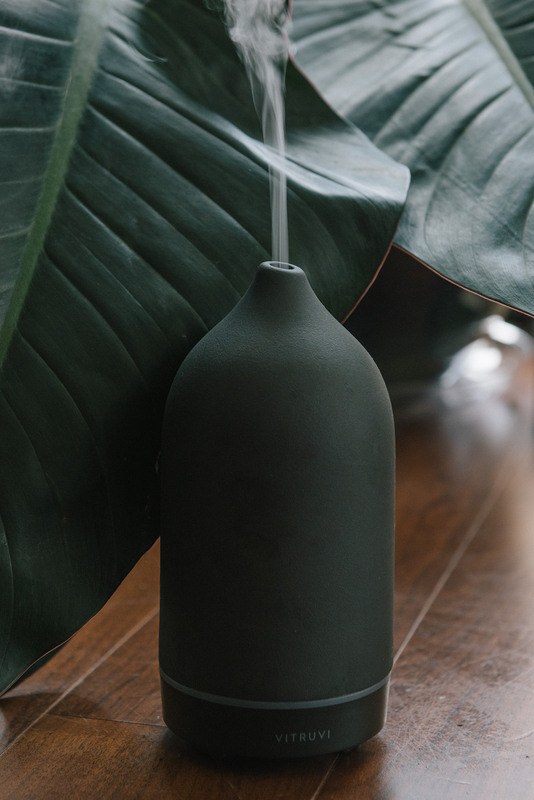 If you do not have a diffuser, I do recommend the handcrafted blackstone diffuser by Vitruvi. I’ve been using it every day for 1 month and have super pleased with it. The ceramic top is handcrafted with quality porcelain. You can learn more about it HERE. I got into essential oils a few months ago but have stopped because I found out that some oils are very toxic to cats (and I have three!). See this site, or Google for a list of other oils toxic to cats. Oh goodness! thank you for sharing that with me I’ll look into it deeper.